“The film adaptation of Stephanie Meyer’s enormously popular vampire romance Twilight took audiences by storm in the winter of 2008. Robert Tonner takes the film’s memorable characters and transforms them into exquisitely detailed collector dolls. 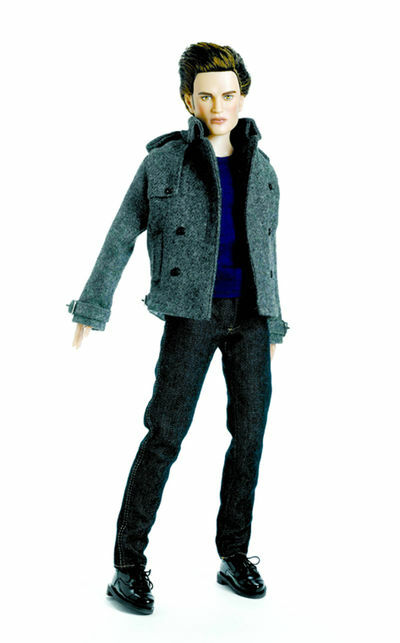 The ageless vampire, Edward Cullen, is sculpted in the likeness of actor Robert Pattinson and stands 17″ tall, with 14 points of articulation. His human love, the vivacious high school student Bella Swan, portrayed by actress Kristen Stewart, stands 15″ tall with 15 points of articulation. I don’t know too many of us in the market for a $150 Edward doll, but if you are a collector of this type of item, these will likely go quickly. If it’s out of your price range but you want something similar, check out the Twilight Edward Cullen and Bella Swan Action Figure 2-pack. At only $28 for the pair, it’s a little more realistic. hey can u help me? well i was wondering if they sell the dolls cheaper or where they can sell the dolls or the action figures with Bella including.